The Cipriani ballroom on Wall Street was filled this morning with active-duty military members and young veterans whose jutting jaws, neatly parted hair, and shined shoes made them look like, well, Wall Streeters. They picked at fruit skewers and listened to executives from America’s biggest banks praise their service. The scene was Veterans on Wall Street, a conference sponsored by Goldman Sachs, Citigroup, Credit Suisse, Bank of America Merrill Lynch, and Deutsche Bank that is, depending on whom you ask, either a savvy recruiting tactic or an effort to drum up good PR for the financial services industry. VOWS, now in its second year, has become a central recruiting tool for investment banks, who see veteran outreach as a way to bolster both their ranks and their Main Street credibility. Last year, the first time the event was held, between 100 and 200 veterans received jobs from the 100-plus companies that attended. These days, Wall Street loves veterans. Jamie Dimon has bragged about hiring ten veterans a day at JPMorgan Chase. Veterans were the stars of this year’s Robin Hood dinner, whose deep-pocketed Wall Street attendees raised $11.9 million for a veteran-relief organization. Gretchen Morgenson’s Times column last weekend about Drexel Hamilton, a brokerage firm that prepares disabled vets for Wall Street jobs, was so popular that Goldman Sachs tweeted about it, marking the first time the bank has ever agreed with her on anything. For banks, which prize teamwork and persistence even on numbing tasks, hiring veterans is easy to justify. Soldiers who have dodged IEDs in Iraq, after all, are not likely to complain about tricky pitchbooks or having to work weekends. “Coming from the military, we’re a little more prepared for a more intense work style,” Lieutenant Josephsen said. Chris Perkins, a director at Citi who is also a veteran, said that hiring needs, not an industry-wide charm offensive, had led to the increased interest in veterans. Most of the veterans milling around the atrium were wearing sharply pressed suits. A few, though, showed up in their military fatigues. “I was told to wear fatigues — you get a job faster,” said Lieutenant Eric Jones, standing outside the atrium in sizzling heat with a half-dozen résumés in hand. 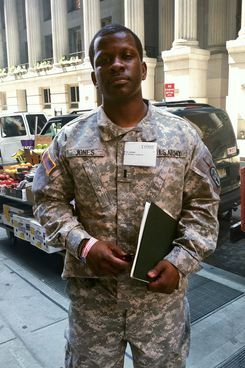 Lieutenant Jones, who was injured in Iraq when his Army Humvee ran over a land mine, returned to civilian life eighteen months ago. Since then, he has set his sights on a job in financial services. He is studying for his Series 7 exam and came to the job fair hoping to land a gig with the brokerage firm Edward Jones (no relation). Matt Milano, an E4 corporal who is still on active duty with the Army in Manhattan, stopped by the career fair to case out his options for six months from now, when his duty ends. Corporal Milano, who was late for work on account of the VOWS fair, said his dream was to land a job with BlackRock, the giant asset management firm, or G.E. He admitted that he might get some flack from his fellow soldiers for going to a job fair in an air-conditioned bank atrium instead of reporting for duty, but said that he had a plan to pacify. “I’ll buy them a beer if I get hired,” he said.